Last night as Eric and I were driving home from a family birthday party, we were singing along to Chris Tomlin's CD. 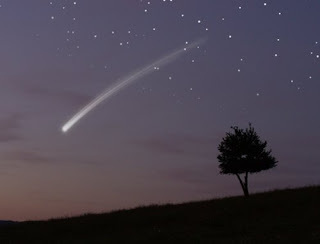 I was looking out the window and saw the most amazing shooting star I have ever seen. I ALWAYS miss them when other people see them, or they are so short I am not sure if I made it up in my head or not. This time it was so long I had more than enough time to realize what it was and enjoy it. It was at least as long as the one in the picture, but not as thick/bright. It was beautiful! Thanks God!